Today marks the launch of Peek, an intelligent and ‘digitally-personalised’ recruitment platform that uses AI, behavioural learning and clever algorithms to make recruitment more relevant to both candidate and employer. 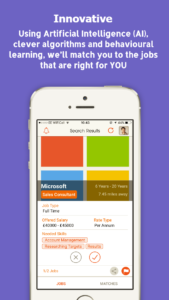 Peek cuts out the middleman, enabling employers to identify candidates that are suited for the job at hand and to then connect directly. Many believe that recruitment in the UK is broken. With a tired format of commission-hungry recruitment agencies moving candidates in through the front door and out of the back like cattle, the current model adopted by most within the industry serves neither the interests of the prospective employees (‘candidates’) nor the employer. The selection process is usually no more than a paper exercise, ticking boxes, matching the basics on CVs with positions and then hoping for the best. For example, ‘job boards’ are focused on volume – meaning employers are usually swamped with hundreds of CVs to sift through – most of which aren’t relevant to the opportunity at hand, and ‘recruitment agencies’ are usually driven by commission, meaning relevant matching isn’t at the heart of their service. Both ‘volume-driven’ and ‘commission-driven’ recruitment solutions ultimately result in irrelevant matches, wasted time and excessive costs. The Peek platform, which is available as both an app and web version, brings a fresh approach that will shake up the industry and finally match candidates and employers on far more than just experience and qualifications. Peek’s purpose is to match not only on ‘skills and experience’, but also on what really matters – personality, culture and values. It is people, personality and culture that are key. No more form ticking and filing, Peek will take in key aspects of a candidate’s personality, values and cultures preferences and match them with an employer who is relevant to their qualities. Past experience, qualifications and skills all have their place, but if the wrong person is in the wrong environment, it can be a painful experience for all concerned. With 46% of newly-hired staff leaving a job within 18 months, and with a staggering 89% of those departures due to a ‘bad cultural fit’, the current model is clearly not working. Had more research been done, more questions asked and a deeper understanding of what both the candidate and employer were looking for, a lot of time, disappointment and expense could have been saved. This is why Peek was created. There are reams of research papers proving that culture matching not only matters, it is the most important factor in matching candidates with employers. Many companies have tried and failed to deliver value while incorporating technology into recruitment – we call it value innovation – but they could not deliver. Instead, most have concentrated in reducing the price of hiring rather than finding the perfect candidate. Less, in this instance, is certainly not more. If an employer chooses the wrong person or relies on recommendations from agencies who use the paperwork box-ticking methods, the result is often an unhappy workforce and therefore no synergy. In turn, this means less productivity and high recruitment costs to replace those leaving, let alone a candidate who is disgruntled and disillusioned with their work life and future prospects. So, the process as it currently stands doesn’t work. Aws Ismail, Co-founder of Peek said: “At Peek we offer an app and website using AI to best match candidates and employers using a simple swipe screen functionality. “The data gathered considers algorithms and behavioural learning to match candidates with employers rather than wading through piles of CVs. It’s more people-driven than anything currently available in the recruitment industry. “Employers and candidates get to peek into the real purpose and values each hold dear to find the perfect match and a form of synergy which is for the long-term benefit of both parties. The importance of placing the right people with the right companies cannot be underestimated. “Our sole purpose is create happier, more productive workplaces and save businesses substantial recruitment costs in the process. Press release distributed by Newsmakers on behalf of theprexpert.co, on Wednesday, 24 May 2017. For more information subscribe and follow https://twitter.com/newsmakers_pr .